A curious mix of laid-back ’50s vibe and resonating refrains captivates listeners’ ears. The mystical trio known as the Barberettes has released their second studio album, named after itself, in 2016. The album’s retro style tracks give the audience a break from today’s fast-paced world, where all struggle to catch up with the trendiest—even in music. With The Barberettes (2016) comes a chance to slow down, breathe and look for the new in what is past. 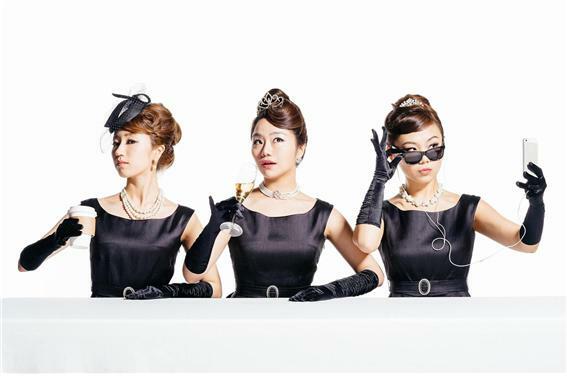 The mere presence of the trio – Ahn Shin Ae, Park So Hee, Lee Kyung Sun—was enough to take the Korean music scene by surprise. It is uncommon for three vocalists to form an indie girl group, let alone perform a style that runs backwards on the scale of time. Although still relatively obscure, the trio gained die-hard fans through distinctive albums, which even featured in soundtracks for popular dramas such as Strongest Deliveryman (2017) and tvN’s Deserving of the Name (2017). Their sound differs greatly from mainstream girl groups’ pop. Everything about their style, from the funky yet sonically cohesive 50-60s vibe to lyric arrangement and song themes, challenges the taste of the young generation. The occasional wild mix of instruments is noteworthy; for “Sold Out Man,” the guitar is joined by a shaker and even a handheld plastic container with a pen for a drumstick. The lyrics similarly diverge from the dominant trend. They consist mostly of Korean vocabulary, an unfortunately rare trait nowadays because of the huge impact American styles have on the music scene. Even the fun chants inserted within songs are old-fashioned Korean onomatopoeia that are ironically foreign in the ears of the younger generations. In a market of music where girl groups parrot worn-out themes such as love and breakups, the Barberettes’ choice of topic is close to refreshing. The songs within the album touch on various spectrums of life, not simply love. They talk about being happy and enjoying the moment, important themes rarely given a full song to be explored today. The lyrics also go at length to discuss some genuine anxieties and concerns about growing up. The song “Love Shoes” (featuring Stuart Zender) is one example—concerns about the right and wrong of adolescence, making the right choices and relationships between family and friends. Singing from a place that is so candid can reach out to many listeners to afford consolation and sympathy; it reassures them that their pain is indeed valid and, most importantly, understood. This vulnerability is precisely what evokes and incites emotions that some mainstream K-Pop music are not able to. No matter how different the album sounds, listeners may come across a strange feeling of attachment for The Barberettes. Its familiarity comes from the fact that in essence, its songs show what K-Pop must have been like before the term was even coined and K-Pop was a well-sold commercial concept. In other words, the girls present in this album a unique form of K-Pop music and how the genre might have evolved had it not been washed away in the oppressive and heavy demands of a highly superficial industry. As different a sound as The Barberettes and the album’s creators offer, at heart what they make is in no way alien. They have been faithful to what songs can and do excel at, spreading joy and love through empathy. The ways the trio goes about doing so is admirable, for their struggle is far removed from K-pop’s fight to find a tiny bit of difference in a sea of overused similarity. The Barberettes march to the beat of their own plastic drum, and every pen-cap beat has its way of nesting in each listener’s heart.